The last post of the June visit to Norfolk (actually managed to get quite a lot in considering it was not a trip specially to see WW2 defences!). Both of these locations on the north Norfolk coast had exits off the beach so were well defended. Brancaster in particular would have been well defended as there was also an emergency Coastal battery located here although not much remains now. Type 28 pillboxes for the 2 pounder anti-tank gun covered the exit at both beaches although both are now virtually hidden by vegetation (it was not possible to get a photo of the one at Holme). Two other pillboxes can be seen at Brancaster, one a unique irregular hexagonal design. Nearby is a pillbox for a medium machine gun, presumably based on the 1936 design sometimes referred to as a Type 27, but is unusual in that it has no chamfered corners. The corrugated iron sheet used for shuttering has clearly left its mark! Christopher Bird in Silent Sentinels lists a Type 24 in the area I but could not find this. At Holme a home guard store and a few pedestals for the Spigot mortar can be seen. 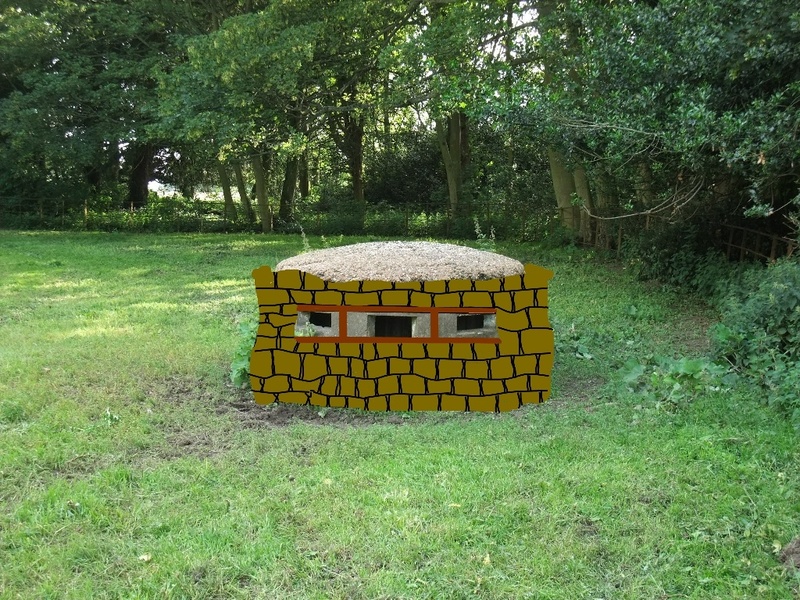 The final picture is of a double light machine gun pillbox unique to Norfolk - this one is at Wells. They were often sited in pairs. Well that's it for Norfolk. Image 4: Type 28 pillbox for 2 pounder anti-tank gun, Brancaster. Might be a bit more accessible in winter! Image 6 & 7: Spigot mortar pedestals, Holme. Image 8: Twin light machine gun pillbox, Wells. Not done much out and about in Suffolk since the visit to Long Melford so another post from the June visit to Norfolk. I took the opportunity to visit Docking to see a Norcon Pillbox. The name is after the company that came up with the design - it is basically a section of concrete sewer pipe with four or five loopholes cut in the side. It was one of several pre-fabricated pillbox designs intended for quick production that were put forward in the desperate days of the summer of 1940. Although quite a large number were used, few survive today. Christopher Bird in his excellent book 'Silent Sentinels' lists three surviving in Norfolk, two at Docking and one at Weybourne. Although his photo of the Weybourne example, dated 1990, shows it complete, later photos I've seen show it badly damaged and I could not find it a couple of years ago when I looked, so it may no longer exist. I know of no examples in Suffolk. The pillbox could either be sited on the ground as it was or dug in. In either case it required sandbagged protection to make it bullet proof and Eastern Command considered it an ideal pillbox due to rapidity of construction. It was intended to form part of a defence along side heavier pillboxes. It was unwieldy to move about requiring tackle to unload from vehicles. With 1 1/2 layer of sandbags externally, a burst from a mg penetrated to a depth of 1.5" and it was obvious that a second burst would have completed the penetration. The Chief Engineer, Eastern Command disagreed. He thought it should be an easy matter for any RE Field Company to unload. He pointed out it was not intended to be used as a hoop (you've got to admit he had a point on this!!) and that the mg was presumably fired from a tripod otherwise the chances of a burst hitting the same spot twice would be remote. Eastern Command considered it provided better protection than many sandbagged only positions that had been constructed. Trials were also carried out on mounting it on a three ton lorry as a mobile blockhouse, but it was too wide and also even if it could be made to sit on a lorry it would not be bullet proof without the sandbag protection. The Norcon pillbox was normally provided with a corrugated iron and timber roof capped with earth. However the two at Docking have a concrete roof - I do not know if it would have been capped with earth. Nearby are two Home Guard stores. Next couple of posts will also probably be from the Norfolk trip. Image 1 and 2: Drawings of the Norcon Pillbox. Image 3: Norcon Pillbox, Docking, unusually provided with a concrete roof. Image 4: A 'sketch' to represent how it would have looked with sandbagged protection. The sandbags over the embrasures would have been supported with timber. I am not sure if the roof would have been capped with earth. Image 5 & 6: Home Guard stores. Spent an enjoyable Saturday at Melford Hall, Long Melford. In the morning continued to assist in the survey of the defences in the Hall grounds, which formed part of the Eastern Command Line. In the afternoon became a National Trust Volunteer, helping dig a 1x1 mtr test pit on The Green as part of a TV series looking at the lives of ordinary people through the ages. The lives of the people of Long Melford are to feature in this and the series basically gets as many local people as possible to dig test pits, record and document what they find, under the supervision of professional archeologists. The National Trust property at Long Melford took part hence me becoming a NT volunteer for the afternoon. Anyway back to the WW2 remains. I had already visited last Apr to look Pillbox ‘C5’ (the reference number given to it on the original plans) with NT surveyor Tom MacKinlay. C5 was a shell proof pillbox with a central AA well to drawing CRE 1113. During this visit we also located the position of the 2 pounder anti-tank gun (serial No F74 on the original plans).This time we wanted to try and find Pillbox ‘C6’ which I realized was on the property after my April visit. We found the approx location of the pillbox – now just a pile of rubble so obviously it had been demolished in the early 70’s to make way for the A134 bypass. Luckily the official records document this as " AA 3'6" " so we know it would have been the same design as C5. We also found the location of anti-tank gun serial No F73. Its location was described in original documents as “Under lime tree in Melford Park” – and yes the lime tree still exists amongst the ancient pollarded oaks! A depression is nearby which maybe the in-filled remains of part of the position. With various contacts with the NT we hope to continue surveying the wider area next winter. Another very productive visit to The National Archives. I hope now to add plenty of material to the website on invasion / War with Germany planning from the 1930’s onwards. I found this very informative as to describing how things got to where they were in Jun 1940 with regards to the defence against invasion. First page, on the war planning in the 1930’s, almost ready to be posted. Finally thanks to the NT for the invite to see these defence works. image 7: View from under the Lime tree- the trees in the background would not have been there in 1940 (or they would have been cleared to give the gun a line of fire) - the gun would have presumably covered the road bridge in Long Melford. The second post from a recent few days in Norfolk looks at the remains at RSPB Titchwell and nearby marshes. The whole area between Hunstanton and the Burnham's have a long history as bombing / target ranges dating from the First War to post second War. Hence making sense of some of remains in the Titchwell area is difficult. Most opinion states that Titchwell was used as Moving Target Range (MTR) for tank gunnery. It may have also been used as a bombing range - there is what appears to be a fairly standard quadrant bombing tower at Thornham Point which overlooks Titchwell Marshes. I am not sure if the tower is second war or post War. There is also the possibility of the area being used as MTR for anti-aircraft gunnery. There is a good post on the whole area on the Airfield Information Exchange Forum. Image 7 to 9: Remains of two light tanks apparently used for target practice. They are probably light tanks dating from the 1930's. Image 10 to 12: Remains of shelter on Brancaster Marshes presumably connected to the ranges in the area. It is a thin walled structure divided into two rooms with a small fire place in the corner of each room. Image 13: Some of the tank shells recovered during recent sea wall works at RSPB Titchwell. It is interesting to note that in 1944 CE Eastern Command faced the same problem at the Boyton AFV Range (now coincidently also an RSPB Reserve) in that a large quantity of M61 HE shells failed to explode on the range. The Catchment Board needed to carry out repairs on the sea wall but would not allow workers on site until the shells had been cleared. As a result the Commander of the range had to carry out 'first aid' repairs on the sea wall in the first instance.